Recipe 51: This is something my mum did during our holiday just to change a bit from the normal vegetable side order. It’s nothing really amazing or particular, but it’s just something healthy and different to eat and that can maybe suits children too. 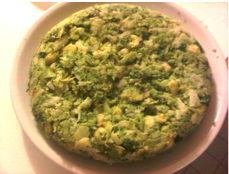 Ingredients: you will just need some broccoli and cauliflower, olive oil, some garlic (cloves or powder), pepper, a bit of chili and nothing else. Wash and cut the vegetable in little pieces, then boil them in some water with salt. Leave them for around 10 minutes. In the meantime put some oil in a pan with some garlic cloves. Let them get goldish and then take them out. When the vegetable are still a bit hard place them in the pan and start to mash them with a wooden spoon or spatula. In the meantime the vegetable will cook in the oil and will take a nice taste. Add the pepper and chili and keep on mixing and turning the vegetables. If they are getting to dry you can always add some more oil. I think the mix could be really good also with something like pancetta, if you like or pieces of sausages. When you think the mix has reach a good consistency, creating a nice pie, you can try to cover the pan with a plate and turn the pie to let it cook on the other side. Keep on turning until it become a little bit colored and when you think is ready you can serve it on a plate or already divided in slices with some meat or fish. PS. Mamy alla fine ho messo anche questa ricetta, perche’ non avevo mai proposto nulla con i broccoli ed il cavolfiore e questo sformato ripassato con aglio ed olio e’ perfetto per non mangiarsi sempre verdure lesse.